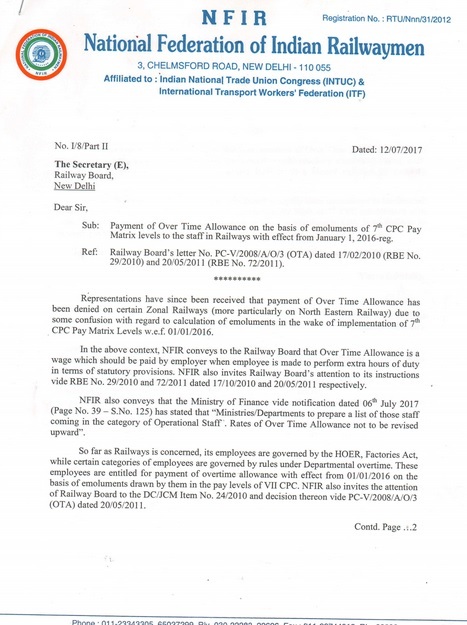 7th CPC : Payment of OTA on the basis of 7CPC pay matrix wef 1-1-2016 – NFIR letter ** National Federation of Indian Railwaymen, 3, CHELMSFORD ROAD, NEW DELHI - 110 055, Affiliated to : Indian National Trade Union Congress (INTUC) & International Transport Workers' Federation (ITF) ** No. I/8/Part II ** Dated: 12/07/2017 ** The Secretary (E), Railway Board, New Delhi ** Dear Sir, ** Sub: Payment of Over Time Allowance on the basis of emoluments of 7th CPC Pay Matrix levels to the staff in Railways with effect from January 1, 2016-reg. Sub: Payment of Over Time Allowance on the basis of emoluments of 7th CPC Pay Matrix levels to the staff in Railways with effect from January 1, 2016-reg. Ref: Railway Board’s letter No. PC-V/2008/A/O/3 (OTA) dated 17/02/2010 (RBE No.29/2010) and 20/05/2011 (RBE No. 72/2011). Representations have since been received that payment of Over Time Allowance has been denied on certain Zonal Railways (more particularly on North Eastern Railway) due to some confilsion with regard to calculation of emoluments in the wake of implementation of 7th CPC Pay Matrix Levels w.e.f. 01/01/2016. In the above context, NF IR conveys to the Railway Board that Over Time Allowance is a wage which should be paid by employer when employee is made to perform extra hours of duty in terms of statutory provisions. NFIR also invites Railway Board’s attention to its instructions vide RBE No. 29/2010 and 72/2011 dated 17/ 10/2010 and 20/05/2011 respectively. NFIR also conveys that the Ministry of Finance vide notification dated 06th July 2017 (Page No. 39 - S.No. 125) has stated that “Ministries/Departments to prepare a list of those staff coming in the category of Operational Staff. Rates of Over Time Allowance not to be revised upward”. So far as Railways is concerned, its employees are governed by the HOER, Factories Act, while certain categories of employees are governed by rules under Departmental overtime. These employees are entitled for payment of overtime allowance with effect from 01/01/2016 on the basis of emoluments drawn by them in the pay levels of VII CPC. NFIR also invites the attention of Railway Board to the DC/JCM Item No. 24/2010 and decision thereon vide PC-V/2008/A/O/3 (OTA) dated 20/05/2011. It is reported that on North Eastern Railway, payment of Over Time Allowance has been denied to the A/C Escorting Staff since the last several months resulting resentment among staff. The denial of OTA payment by North Eastern Railway is a blatant violation of statutory provisions. 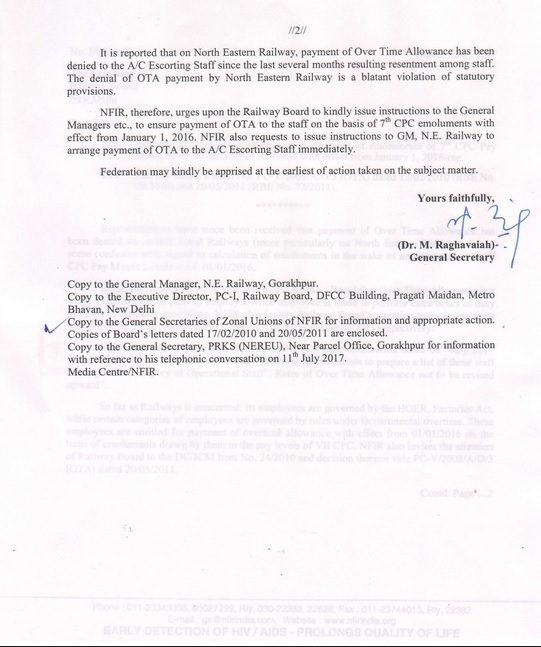 NF IR, therefore, urges upon the Railway Board to kindly issue instructions to the General Managers etc., to ensure payment of OTA to the staff on the basis of 7th CPC emoluments with effect from January 1, 2016. NFIR also requests to issue instructions to GM, N.E. Railway to arrange payment of OTA to the A/C Escorting Staff immediately. Federation may kindly be apprised at the earliest of action taken on the subject matter.